The derelict patch of land that the red-brick factory sits on – just north of the Williamsburg Bridge – will be transformed by landscape architecture firm James Corner Field Operations, which also worked on New York's popular High Line park with architects Diller Scofidio + Renfro. Sports fields, lawns and gardens with seating options and a children's play area all form part of the plans. 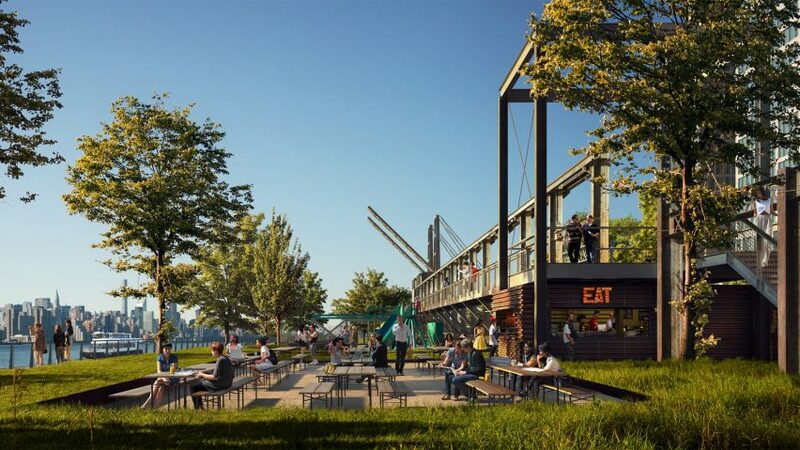 "The design of Domino Park aims to create a space that will revitalise the beauty of New York City's incredible waterfront and foster interest in the history of the site and the surrounding neighbourhood," said Lisa Switkin of James Corner Field Operations. Two Trees has created temporary recreation spaces on the site for the past four summers. The park is due to open permanently summer 2018, ahead of the office campus' completion, while the first of the residential buildings on the site, at 325 Kent Avenue, is set to open in June 2017.